And I looked and beheld a man among the Gentiles, who was separated from the seed of my brethren by the many waters; and I beheld the Spirit of God, that it came down and wrought upon the man; and he went forth upon the many waters, even unto the seed of my brethren, who were in the promised land. It was reinforced in the class that the “man among the Gentiles” is Christopher Columbus. I suppose that in reading verse 12 you would think that the Spirit coming down and working upon someone would mean that they were righteous and sent by God to do good. In this country we celebrate Columbus Day and it seems as though many Latter-day Saints hold him with a kind of reverence, see him as a visionary, and perhaps even a prophet of sorts. Wait a minute, am I suggesting that Columbus was sent as a scourge, how is that possible? Well I started out by quoting 2 Nephi 13:12, but let’s look at verses 11 and 12 together because the slip of paper didn’t include verse 11. And it came to pass that the angel said unto me: Behold the wrath of God is upon the seed of thy brethren. 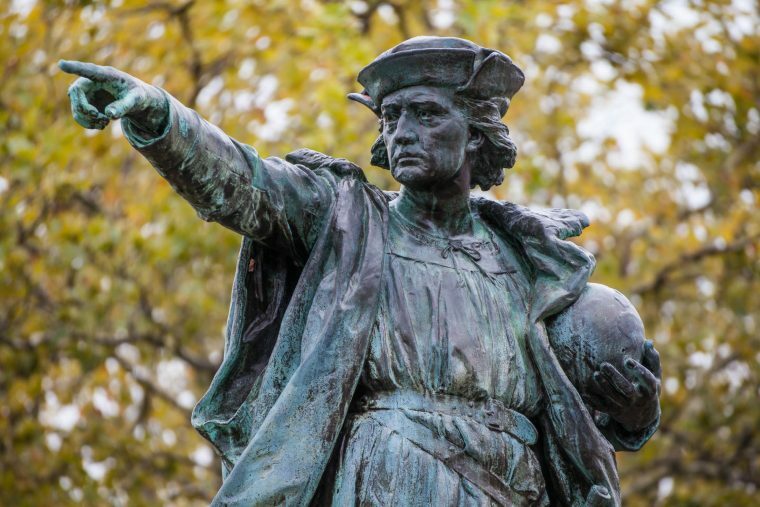 The truth is that Columbus’ arrival was not something that blessed the people. Columbus and his men plundered, enslaved, and indeed scourged the people they found. Noses and ears were cut off if people refused slavery, humans were cut up and used for dog food, and the whole civilization was depopulated through the slave trade, forced labor in mines, and continual plunder. On the whole, the Gentile arrival to the New World brought scourging, depopulation, scattering, and all the curses we see prophesied in the Book of Mormon. On the whole it is a complex situation; while the Gentiles come to scatter, scourge, and conquer, they bring with them the records of the Jews and of the early Christians. In the darkness that fell over the inhabitants of the Americas through the invasion of the Gentiles, at least there existed a perpetual ember of light in the form of the gospel. It’s curious that we celebrate a man who resembles someone more akin to the King of Assyria in Isaiah’s writings. While I’m not entirely sure that “the man among the Gentiles” was specifically Columbus to begin with, he does seem to fit in many respects and especially when viewed in the context of the wrath of God and what he and his people did to the natives. History is always, 100% of the time, way more nuanced and complex than we think it is. Many villains are not as completely dark as we once assumed and many heroes were not the shining beacons perfection we assumed they were. This is also the case with many people throughout the scriptures. King David did some disgusting and horrifying stuff, yet his psalms were quoted by Jesus. When you are dealing with the history of fallen humanity, it is clear why God says that the natural man is his enemy (Mosiah 3:19), but what else does he have to work with? Somehow, in the midst of all the suffering and darkness, there is beauty, hope, and peace. Judgement is left up to the only one who knows the hearts of all men. I was endowed in the Columbus, Ohio Temple. I’ll have to go back sometime and check if there are any Assyrian motifs in the architecture. I would doubt that you would find anything like that. The temple architects don’t go that deep with symbolism. While it is true that some artists are inspired to create windows and art that is deeply symbolic in the temples, they appear to relate to salvation-based themes rather than punishment-based themes.